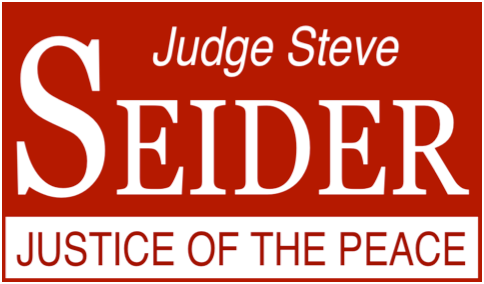 Q: What area does Judge Steve Seider serve and who can vote for him? A: Steve serves in Justice of the Peace Precinct 3 and the voters of Precinct 3 elect him. The office is Justice of the Peace Precinct 3, Place 2. Q: Judge Steve Seider serves in Precinct 3, but the office is Justice of the Peace Precinct 3, Place 2 -- what is “Place 2”? A: Justice of the Peace Precinct 3 has two “Places” – both “Places” have concurrent jurisdiction over Justice of the Peace Precinct 3. The “Place” is a term that is used to designate different elected offices with concurrent jurisdiction and within the identical geographic area. • “Place” is also used to designate offices on Texas’ Courts of Appeals, the Texas Court of Criminal Appeals and the Texas Supreme Court. • While all of the other courts that contain the designation “Place” occupy the same courtroom and courthouse—the Justice of the Peace “Places” do not use the same courtroom, nor are they located in the same courthouse—even though the geographical area of their jurisdiction is identical. • Judge Steve Seider hears cases in the courtroom for Justice of the Peace Precinct 3, Place 2 - in the Richardson Government Center located on Beltltine Road just east of Coit Road in Richardson, Texas. • Judge Al Cercone hears cases in the courtroom for Justice of the Peace Precinct 3, Place 1-- in the North Dallas Government Center located on Marsh Lane near Walnut Hill Lane in Dallas, Texas. Q: Do I vote only for the Justice of the Peace that is closest to my home?... or… do I cast a ballot for both Place 1 and Place 2? • Just as you cast votes for each “Place” on a Court of Appeals, the Texas Court of Criminal Appeals and the Texas Supreme Court, you vote for each “Place” for Justice of the Peace. • If the race appears on the ballot, you can-- and should—cast a vote for the candidate you believe would best serve in that office. Q: How can I vote to re-elect Steve Seider as our Justice of the Peace, for Precinct 3, Place 2? o This will be near the VERY END of the ballot, as the offices are listed on the ballot in order of their jurisdiction. o If you cast a “Straight-Party” vote for all the nominees of one party AND also cast a vote for the opponent of one of that party’s nominees, your vote for the opponent will be counted as well as your vote for all of the other nominees of the party for which the “Straight-Party vote was cast. Q: What kind of cases are heard by a Justice of the Peace?